Back in my younger days music was so tribal, so segregated, a mindset that is entirely different from how I consume and appreciate music these days. Maybe with the youngers, it’s still like that, I don’t know and it’s not my call anymore. I was a punk rock/new wave kid back in the 70’s and 80’s and if you weren’t you didn’t get it. You were old school and out of touch. You just didn’t get it. The Punk Rock kids thought the stoner kids with their Led Zeppelin fascination were dinosaurs. The stoner kids thought the Punk Rock kids were a bunch of slam dancing morons. The mainstream rock kids through you were weird if you disliked Journey and Foreigner. The Deadheads thought it was all pretty amusing, they stayed in their lane but thought everyone else had just plain lost the plot. Maybe those Deadheads had a point. Rock ‘n’ Roll was not a blanket term used to cover all these seemingly disparate constituencies anymore. Each sub-genre had it’s own cultural cover and rarely did the tribes meet. In fact the intersecting of those seemingly disparate tribes was sometimes met with open hostility. But everybody liked Tom Petty. He was the thread that stitched together these varied and oftentimes warring factional quilts into a seamless blanket that covered us all. He put that blanket back where it belonged. I remember hearing “Don’t Do Me Like That” on WOUR, at the time a really great radio station out of that center of cultural coolness, Utica NY. Me being a major Costello fanatic loved the playfully fast lyrics with the backing keyboard, I may have actually thought the song was one of Mr. McManus’s at first. “Breakdown” “Refugee” “Even The Losers” were all favorites, played loud from cassettes in the various junk cars I would get ahold of back then. I even had a cassette of a Petty and the Heartbreakers concert that aired on the King Biscuit Flower Hour that I played incessantly. I can tell you from personal experience that Tom Petty & The Heartbreakers sound particularly great played from a rusting old 1979 Monte Carlo. 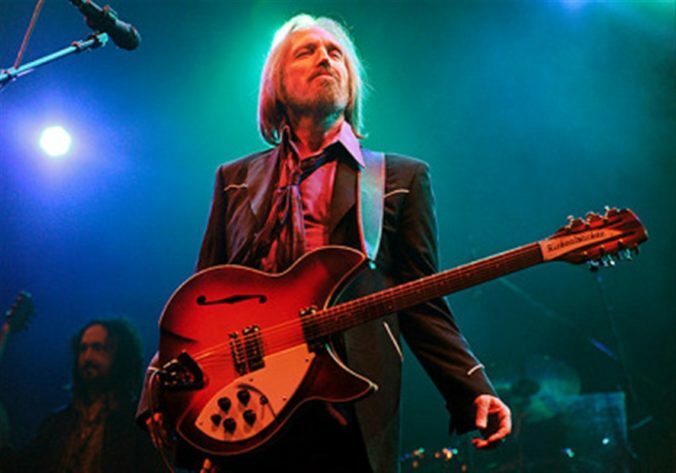 His songs sounded like America, be it highway 441 in Florida, or free falling in Encino, Tom Petty sounded like America, the American youth experience at first, and he grew older along with me. He was always there and I took him for granted. Tom Petty & The Heartbreakers were for my generation, America’s house band, more so than Springsteen even who I only warmed up to and then only in smaller does as I got older. Tom Petty could open for the Dead, play with Dylan and Orbison and still be punk rock enough to fight with his record label to keep the prices down for the fans. Tom Petty could duet with Axl ninety minutes after the Replacements opened for him at the NY State Fair on a crappy grandstand stage and make it for that night the center of the universe. I’m scratching my head here trying to think of the last musician that I was exposed to on rock ‘n’ roll radio that had staying power over decades and it may have been Petty. For a kid like me who was still so musically siloed, but loved Tom Petty, his duet with Stevie Nicks gave license to break out of my punk rock fascism and explore a little bit, but god never admit it to a kid with a Mohawk. Just don’t. I don’t have to remind you of the deep catalog this guy leaves behind. Like all the music I love, Petty had credibility, integrity and more good songs than anyone has a right to have. Although he made a fantastic solo album, and found brotherhood as a Wilbury, he was also smart enough to know he could never find a band as good and as fused with him as the Heartbreakers he came up from Florida with. It was hard to not be impressed with how that band with Tom at the helm, moved with one motion through their impressive musical repertoire. He had just finished what was supposed to have been his last major tour, his “last trip around the country” as he called it when he died. The press reported his demise hours before he actually passed away, I think he would have found that hilarious had he hung on. He was a constant and I never imagined a world where Tom Petty wouldn’t come around here no more. I’m not the most prolific blogger in the world. I don’t even publish on a schedule. I am working on that, but until l do, wouldn’t you like to just get notified when I update? Maybe even get some extra ramblings?